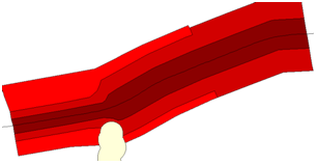 General process: Exclusion zones --> (rough delineation with general classes) --> (detailed classes) --> (photo-based delineation:) Structure Plan. These procedures have a high demand on processor and memory of your computer. Have a look at the technical notes (Chapter 7.5.5) for solving any technical problems encountered. Before you start, load the classification (classes) for the Structure Plan (style library StructurePlan, see Annex 6.4). 0. 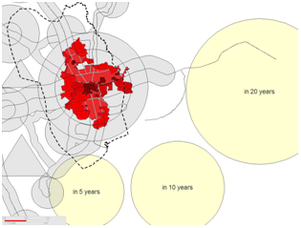 For urban settlement schemes, calculate the area required for housing, based on quantitative forecast calculations in the MTDP and the Framework, if this not done already at the Framework preparation. See also Annex 15 for statistics and examples on population projections and planned population forecasts. For example, a land requirement table can look like the one below. Figures are based on population forecast, as calculated at step 1 of Chapter 7.4.3 . For comparison, most European capitals have an average density of 50-100 p/ha inner city, 30-50 p/ha entire city, US-American cities 25-40 p/ha including area overhead for support structures). (*) 1st figure for low growth, 2nd figure for high growth forecast assumption. Thus, the total area for residential use will be at least 3,400 ha, 4,700 ha and 8,100 ha in 5, 10 and 20 years time. (All figures in this approach are very approximate and should only help to give a rough estimate). Decide on the best and most likely scenario and visualize the area required for this scenario. 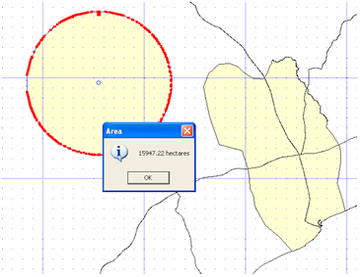 Or, you can draw a circle next to your planning area (with right-mouse > Drawing > Circle) and then measure the area of the circle (with same command as above). You now have an impression how much land will be required for the chosen scenario. This ‘area’ has to be ‘distributed’ in the planning area. 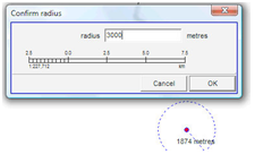 radius = sqrt( area (in ha) * 10,000 / 3.14 ). You can have these zones as separate layers or – better – merge them into one layer by collecting them individually, then one after the other copy to the same live layer, and save this in one file, which is the first version of the Structure Plan, e.g. Kasoa_structure_temp01. 2. As development relies on development axes (‘corridors’), you have to draw major roads, both existing roads from road map and planned, new roads for road corridors in future. Both MTDP and Framework (see Chapter 7.4should guide you. You can start with the planned road layer for the Framework (step 2 of Chapter 7.4.3 but might need more details (and more roads). - Draw the road with the Line-tool from the toolbar left. In many areas, feel free to bring new ideas for the course of the roads. When taking road proposals from existing road layer, delete all other road, then possibly connect road segments into one road and straighten it. Do not forget, this is a plan, not an engineering drawing for road construction. Remark for step 3ff: The operational, practical step of Structure Plan approximation(s) has not been established for land use planning at TCPD. Some steps have been taken out. 3. Have a draft concept, where to place the major kinds of land use (major planning zones). Other planning-specific areas might be included in this list on higher or lower priority. At this stage, dont worry, if units are defined only 'generally', i.e. 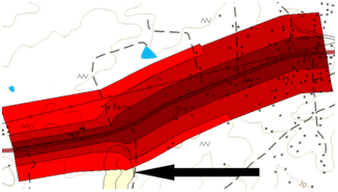 only with their general spatial delineation, and if some of the units overlap in this stage. It is common to have such a common ‘conflict’ over land use. This will be sorted out later in the process, both at the GIS and in participation with stakeholders and the community. 4. 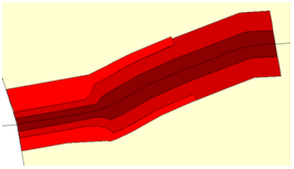 Buffer roads with individual buffer widths. For example, give a width of 100 m on both sides of main national highways, 50 m on other main trunk roads. - 4.1 For such a differentiated buffering, you first create layers with different road classes. 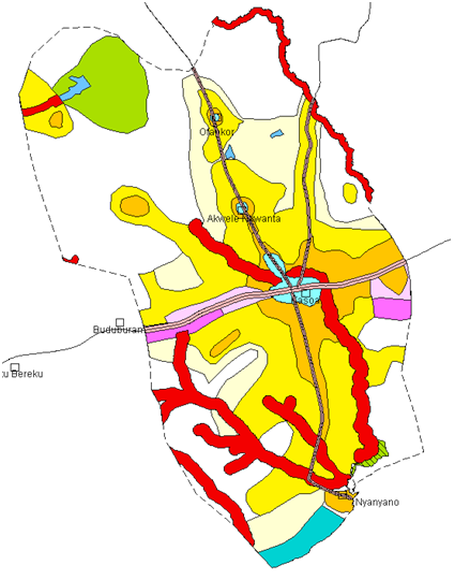 (For example, layers Kasoa_roads2buffer1 and Kasoa_roads2buffer2). Draw 2-6 parallel buffers along a main road (see Chapter 3.1 for general buffering procedures). Follow instructions in Chapter 3.1.5 for clearing the many vertex points. Assign general planning units to the buffers. You might have to cut units with the Cutter-tool and/or to combine them with the Join-tool from the toolbar left (before, snapping with the Snap-tool) and/or to make smooth transitions by editing vertex points of the polygon(s), followed by snapping. 5. Buffer rivers in a similar way, if they form flood protection areas. 6. In a similar way as explained above with the development corridors (buffering), proceed with development centres or hubs. Create buffer circles around the centre points and combine them. 7. 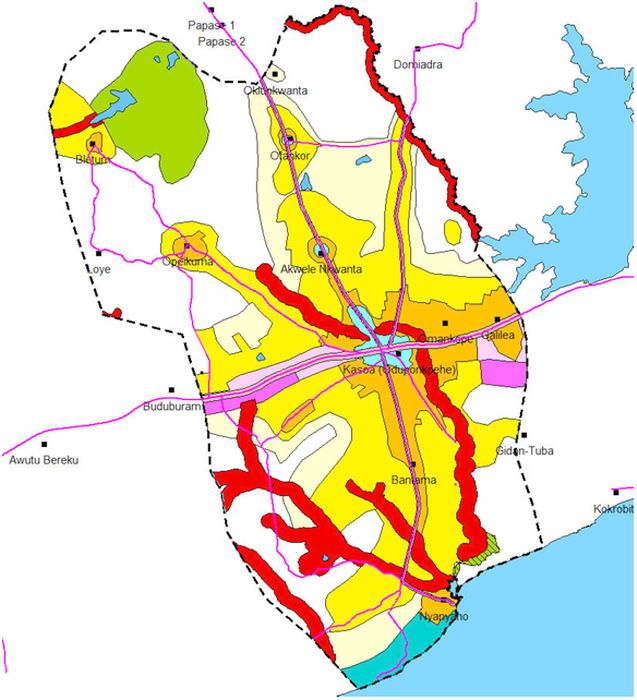 With exclusion zones (see step 1 above), industrial and commercial areas (see step 4 above), defined and all in one temporary layer (for example, Kasoa_structure_temp01), you assess the extension of the residential area. Take the current land use map (see Chapter 7.2) and delete all non-residential areas. 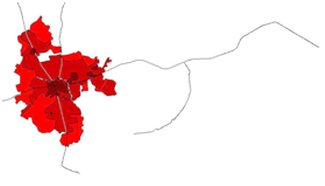 Thus, only low, medium and high density residential areas should show. Combine these three different levels into one (with the Join-tool from the toolbar left, see Chapter 2.12). Set this currently populated areas in comparison with the area required under the forecast (see above). Be aware, that quantitative definitions of ‘low, medium and high densities’ of these two assessments might be different. Assign additional space around the residential area in direction of development according to the Framework. Have a display showing current residential areas, scenarios of future land requirements and Framework recommendations. 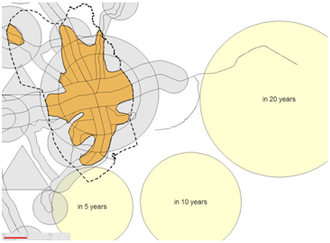 From there, you can draw the extensions of residential areas – in general terms. At this stage don’t worry about minor topographic ‘conflicts’ or ‘incompatibilities’. By now, you have a picture of the residential area extension in the planning area. 9. You might still have polygons overlap each other. In the example below, the road buffers and the river buffer overlap and have to be clipped against each other (‘intersected’). If some units disappear, you have obviously not snapped them properly. Snap all boundaries and repeat the process of intersecting the layers. Be aware, that through this process you loose your display labels and styles. It is the easiest (but not shortest), to assign them again. Alternatively, you can use the seed facility (see Chapter 4.6). 10. Unless you did before, clip with the planning area layer by right-mouse > Live layer actions > Live layer actions window: Basic operations > Cut with file > OK > Cut with file window: Cutter file > Select folder and file name of planning area layer > OK (see also Chapter 3.6). Remark for step 12ff: The operational, practical step of Structure Plan approximation(s) has not been established for land use planning at TCPD. Some steps have been taken out. 12. After this, get a more detailed description and definition of these planning zones, but not necessarily a better ground-delineation. I.e. 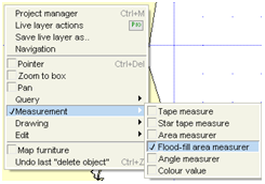 refine the broad, general units of the previous steps to the structure plan classification (see Annex 6.4). Load the classification (classes) for the final Structure Plan (style library StructurePlan, see Annex 6.4). 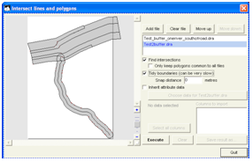 Copy the layer created in the previous steps (1-11) to a different file (e.g. Kasoa_structure_temp51). Have the land use map as a background (e.g. as a line map, with style Polys_AllTransp). 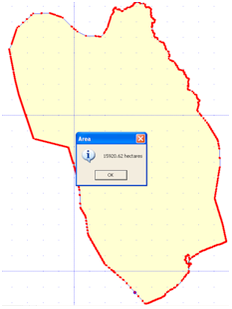 You can also have the raster map or the orthophotos or a topographic map as background. Zoom in to a slightly more detailed scale (screen scale of 2 – 0.5 km). Do not attempt to see all details. You will only loose the overview. 13. Use the Cutter-tool from the toolbar left to split the units. (See technical notes in Chapter 7.5.5, particularly part B). Poor environmental conditions (if infrastructure can not support sufficient human carrying capacity). Create a good mix of low, medium and high density residential areas. 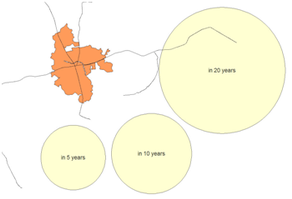 Have an empiric approach, how large each unit can be (in peri urban areas some 500-1000 m, in central urban areas smaller, in rural areas larger). - 13.3. Split industrial areas according to their main function. Save this layer in a new file. It is recommended to use the letters 2ndapprox at the end of the file name (e.g. Kasoa_structure_2ndapprox). It is important that delineation of planning units does not interfere with existing structures on the ground in a destructive way. The background information of the most recent orthophotos is therefore important. You should zoom in to a screen scale of 250-500 m to see all details. Incorporate all natural features, which wee mapped for the land use, such as rivers, mountains, lakes into this final Structure Plan. Feel free to change units and boundaries. This is still possible in this stage. You can also allocate areas of transition and mixed land use. In already built-up areas it is often easy to ‘twist’ around existing structures, which can not be changed, i.e. established building, constructed roads, bridges, exclusion areas. You have to be in editing mode (live layer) with – preferably – a ‘transparent’ style for the layer. 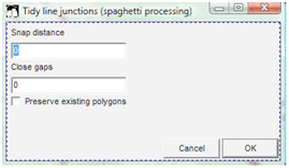 If you change the boundary between two land use zones (polygons), be aware that you have to change the boundary of each of these two polygons, and snap them together afterwards. The best is to go through the entire planning area, from North to South, from West to East, photosheet by photosheet. By now, you should have a good understanding of the entire area, of the terrain and of the existing structures on the ground. You now have a lot of data, i.e. 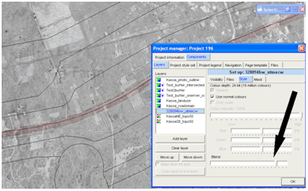 map layers, that you can display and present the final Structure Plan. 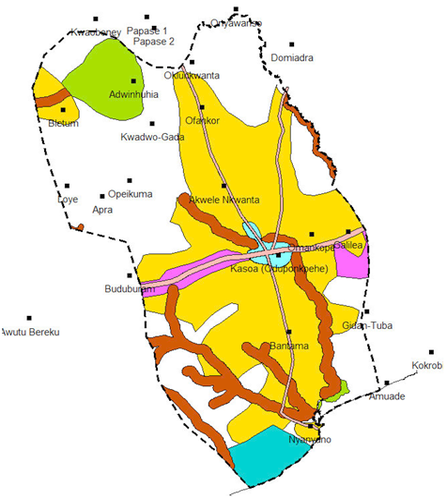 The sample map below demonstrates the basic features of a Structure Plan, here of the Kasoa planning area. The actual Structure Plan of this area considers more input parameters and is considerably larger and more complex, and has marginalia and legend (see Chapter 7.5.4).